As the most famous site in Peru, Machu Picchu draws travelers with its mystical presence, ancient charm and scenic beauty. This “must-see” location is the focus of most trips to Peru, but many travelers also want to experience Peruvian highlights that are off the beaten path-or beaten Inca Trail in this case! Below, we highlight four experiences in Peru that aren’t found on most standard itineraries. Breathe in the ocean air on the sunny beaches of Mancora. Board a boat and search for humpback whales, hop on a surfboard for lessons with the locals or soak in some sunshine on the relaxing beach. Drink in the Milky Way while staying in a transparent (and adrenaline-inducing) Skylodge in the Sacred Valley. Board a luxury train for an two-night trip through the Peruvian highlands or explore the impressive Colca Canyon on the back of a famous Peruvian Paso horse. Get to know Peru beyond the bucket list. Mountains, valleys and rainforests are the scenes at the forefront of travel to Peru, but the coastal country also boasts sunny beach destinations like the small town of Mancora in the northwest. At Mancora, search for humpback whales migrating from Antarctica in August through November and keep an eye out for the countless dolphins, sea lions, sea turtles and frigate birds that grace the warm Pacific waters. Take a surfing lesson with the locals, who view surfing as a spiritual experience, or wander through the town’s Hippie Market. Pair your activities with relaxation on the beach or a yoga class or massage offered at your beachfront retreat. Committing to a trip that’s off the beaten path sometimes involves a bit of courage and a willingness to get creative with accommodation options. The “hanging bedrooms” of Skylodge Adventure Suites fit the bill on both aspects. The unique property invites guests to stay in transparent bedrooms with unprecedented views of the Milky Way, the Sacred Valley and the mountainsides off which the modules hang! With a steel-cabled climbing route and zipline as part of the arrival process, the journey to the Skylodge ensures an adventurous encounter for each guest. 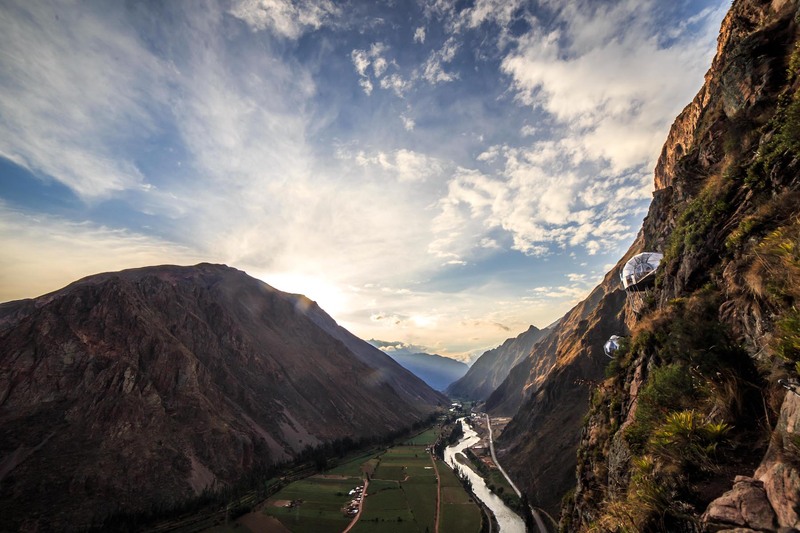 With room for up to four travelers in each suite, a private bathroom and privacy curtains, these transparent domes boast an unforgettable way to experience the Sacred Valley. Often, the time it takes to transfer between one destination and another is seen as a necessary evil in an itinerary, but a trip aboard the Belmond Andean Explorer challenges that assumption. Departing Cusco, the luxury train traverses the Peruvian highlands on its three-day, two-night journey to Arequipa. Along the way, the train stops to give guests the chance to view the sunset over the La Raya mountain range, visit the traditional islands of Lake Titicaca and explore the 8000-year-old rock art of Sumbay Caves, among other schedueld stops. Introducing a relaxing pace to any Peru itinerary, the train’s comfortable sleeper cabins and ornately decorated interior encourage guests to drink in the passing scenery, enjoy a spa treatment or make new friends over a Pisco Sour in the piano bar. As one of the deepest canyons in the world, Southern Peru’s Colca Canyon is a breathtaking wonder that offers so much more than scenic views. Archeological sites, ancient rock art, colorful villages, hot springs and rare wildlife like the Andean condor area make the region a perfect addition to any Peru itinerary. Here, active travelers can hike in the canyon (which is twice as deep as America’s Grand Canyon) or ride the famously smooth-riding Peruvian Paso horses along the canyon top for a local twist. We designed a 16-day itinerary to Peru with Explorandes, our local partner, that includes all of the unique experiences described above and many more. Looking for other experiences, activities and destinations in Peru? Let us know your travel style, and we’ll design a trip just for you.